How do I Ship Online? Online Shipping Made Easy! If you’re selling online, but still going to the Post Office, you’re missing out on some big savings! You may find yourself asking “How do I ship online”? With a couple home shipping supplies, purchasing postage through PayPal and USPS.com can save you both time and money. When shipping, PayPal shipping should always be your first choice. Packages under 16 oz can be sent First Class. It’s very important to know that a shipping weight is always rounded up and inclusive of ALL packaging and the label. So if your package is 16.0 oz, it has to be sent Priority Mail. 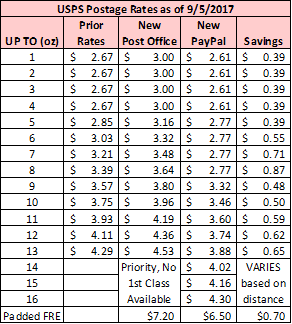 Below is a table showing the current rates for shipping through PayPal. The First Class rates are the same as at the Post Office, but First Class shipping over 13 oz is only available online through PayPal. Both First Class and Priority Rates are cheaper online than at the Post Office. How do I ship online? Polymailers: These are plastic mailers that are used to package your shipment. They are about $13/100, so extremely inexpensive compared to manila envelopes, they also hold up much better than paper when packaging clothing. The mailers that you receive can vary in quality. Lately I have been using these colored or printed mailers because they are sturdier than recent orders I have made of the white mailers. The white mailers are cheaper, but you are talking about a couple cents per mailer extra for colored which are much better quality. If your shipment is over 16 oz, you have a couple options. The first thing to do is to ask the buyer what their zip code is. Priority Mail has two different options. First, regular Priority Mail is distance based. So if your buyer lives a state or two away, this is often cheaper than the second option, Flat Rate. Flat Rate is the same price, no matter where you are shipping. USPS.com offers free packaging for flat rate options. You simply order online and they are delivered within a week to 10 days. I find that the most useful are Padded Flat Rate Envelopes, Regional Rate A1 Boxes, and Regional Rate B1 Boxes. Once you have your buyers zip code, weigh the package and put the details into the USPS online shipping calculator. This will tell you the cheapest way to ship. Regular, distance-based, Priority Mail postage can be purchased on PayPal like a First Class Package. PayPal also supports Small, Medium & Large Flat Rate Boxes (these can be ordered online or picked up at a Post Office). If you will be using a Regional Rate Box, the postage must be purchased at USPS.com. When shipping through USPS.com, there is the option to notify the recipient of shipping by providing their email address. This is a great way to let the buyer know that the package has shipped and ensure that they have the tracking available. The rate between a cardboard Flat Rate Envelope and Padded Flat Rate Envelope is different. Using the wrong type of postage could result in postage due when the buyer receives the package. It should also be mentioned that not all Priority boxes and envelopes are flat rate! Be sure that if you are using Flat Rate postage that “Flat Rate” is printed on the box or envelope that you are using. It can be a costly mistake! Need supplies? The collage below has everything you need and is clickable! Just click what you need for a link to what I use to ship my packages! Previous Post Limited Release: Tea Collection Favorites!